My introduction to hybridising dahlias began just one year after I started growing them in 1969. I met George Wilson, then President of the National Chrysanthemum Society, as a result of purchasing dahlia plants from his nursery in Cricklewood, North London. 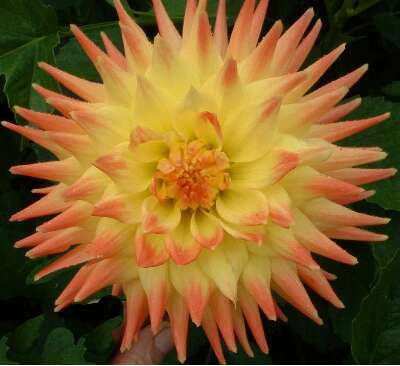 He was a real character who set out to convert anyone who showed any interest in dahlias into a dedicated enthusiast. At that time George, who had a pacemaker, grew 1800 seedlings a year. Because of his health he was handing over the running of the business to his family, but was keen to see that his hybridisation programme was continued. �Come into my Holy of Holies� he said to me one day and I found myself in his very private greenhouse. I emerged with a small packet of �special� seed, which George assured me would produce small decoratives only. Out of complete ignorance I was completely unimpressed, having only reached the stage of knowing about the ten classifications of the dahlia. Throughout the dahlia flowering season George walked around his plot with a couple of small brushes in his pocket and was prone to tell anyone who was in earshot that he could �smell� when the pollen in a flower head was ripe! His method was to bag the flowers he pollinated and record the parents. I didn�t really want to get into this aspect of dahlia growing. Just a couple of years previously I had seen some giant dahlias grown on the allotments opposite my house and thought they were amazing, despite the lack of attention they received. I reckoned that with some real dedication that I could produce some spectacular results. However, I grew George�s seed (quite a few succumbed to novice stupidities) and had seven quite good plants that indeed all conformed to the small decorative classification. As I recall it the colours were nondescript and I really did not have a clue as to their exhibition potential. Inexperience resulted in their demise the following winter. In retrospect the concept of producing specific classifications as outlined above seems fanciful and that has been the reaction of hybridists to whom I have told this experience. George was indeed an �over the top� character and this anecdote demonstrates his persona. My next foray into hybridisation was again as the result of meeting an extrovert dahlia enthusiast � my great friend Jack Kinns. Like George, Jack also had a nursery. 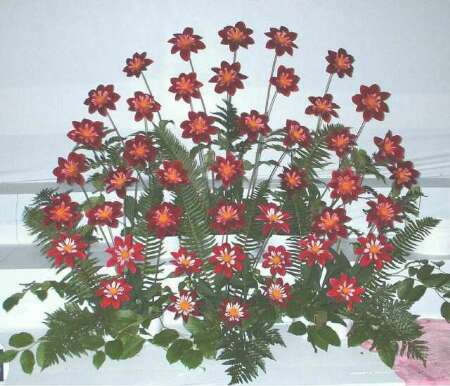 His passion was producing new varieties of Waterlily Dahlias, although he also had a good number of top winners of other classifications prefixed by the �Abridge� cultivar-group name. Jack supplied me with his latest varieties, but was somewhat �miffed� when I beat him at a National Dahlia Society Show with HIS varieties! So I decided to see if I could beat him at his own game and in 1996 planted 200 seedlings having Glorie van Heemstede as the seed parent. The row consisted of 4 plants across and 50 deep. When I stood at the end of the row when the plants were in full production I was surprised by the limited range of colours � almost all were a dull yellow with just the odd one which was red or white. The experiment was repeated in 1997. Only one cultivar remains � JUDY TREGIDDEN. This is an orange waterlily, which won a bronze medal at the NDS Trials at Leeds in 2001 and is available in the Halls of Heddon catalogue. It was recorded in the 15th Supplement of the RHS International Register of Dahlias. Conversations with fellow hybridists have resulted in the observation that received wisdom suggests that one new variety of note results from between 200 to 400 seedlings � the evidence above fits in with this contention. In 1995 I grew 12 plants of collerettes in containers in a tunnel covered in Rokelene netting. The varieties were THAIS, CLAIR DE LUNE, LA CIERVA and CURIOSITY. Very few insects penetrated the netting and as a result of poor pollination very few viable seeds were obtained. However seedling 642 was a distinctive purple colour with a white collar. This was selected for trial at Leeds, but in common with all collerettes did not merit an award. Subsequently it was named Laura Ann Owen after the granddaughter of the Trials Manager, Brian Owen, but has not been registered. One other variety remains from this period - seedling 79 - which is a small semi-cactus. This is very unusual being yellow with orange tips. It is due to be exhibited in 2005 having so far been grown as a garden flower by quite a few growers. I experimented during this period with different methods of obtaining seed other than allowing pollination to proceed naturally, in an attempt to have some control on the process. 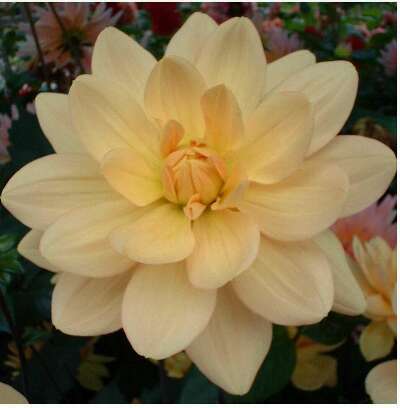 After discussing the procedure with Dr. Gareth Rowlands who was a friend of mine whom I met when we were members of the Executive Council of the National Dahlia Society, I brushed pollen from a bagged known variety onto a selected seed parent flower. Maybe because of ineptitude very few viable seeds were produced, so trials with any statistical significance were ruled out. I suggest that pollination occurs over quite a few days in the natural habitat as the stamens open in succession, so one application of pollen on a given day is likely to be only partially effective. I also tried separating plants by two hundred metres and growing only one classification on one of the sites. Unfortunately it was not possible to follow this experiment to a satisfactory conclusion as we moved to a smaller plot of land. I came to several conclusions about hybridising dahlias at this stage and decided that on moving from our 3.5 acre wind blown grounds at Bickleigh to a standard garden in Tiverton that I would put them into practice. For problems or questions regarding this web contact [ProjectEmail]. Last updated: February 26, 2012.